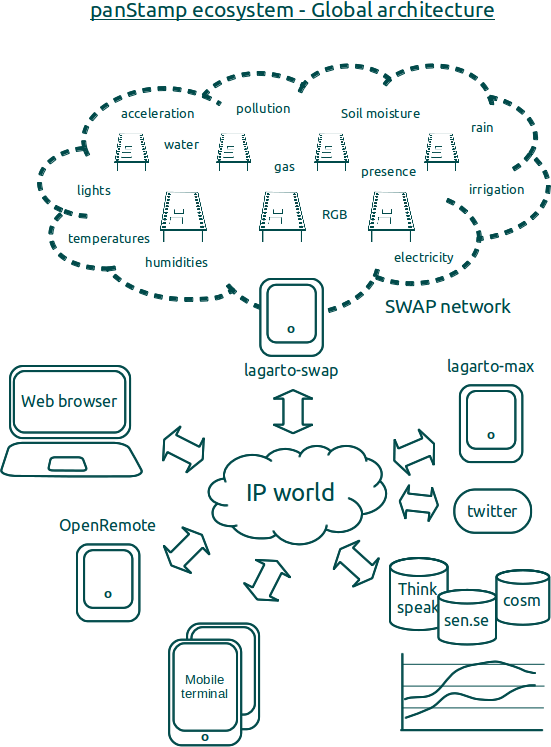 The panStamp project provides a complete solution for those wanting to set-up wireless networks hooked to the cloud. Wireless boards, sensor boards, libraries, communication stack, protocol, management tools and network controller are some of the pieces taking part in this solution. panStamp fully adheres to the "Internet of Things" concept so we want to offer more than a simple collection of electronic boards. Starting from the data collection and actuation, transmission, data management, event handling and finally IP tunnelling, this initiative provides freedom of access to your networks regardless of your technical background. But what is behind the scenes? How can your wireless data reach such a high degree of integration with the IP world? The core of the panStamp project is, of course, panStamps. These small wireless boards are extremely programmable and configurable. They can be plugged into any of the available base boards containing sensors and actuators, or new boards can be developed according to your needs. Base boards generally remain quite simple since most of the electronics are contained in panStamps. Our wireless boards run a compact stack and communicate with each other using a very simple protocol called SWAP over 868/915 MHz. Everything has been designed to perform efficiently, quickly and low-power consuming whilst letting developers focus on their applications. panStamp provides one of the most compact wireless stacks in the market. And it's free and open source. If you have ever played with Arduinos you will find programming panStamps quite simple. panStamps are, in fact, Arduino clones so you will be able to use any of the existing libraries for Arduino on the panStamps too. If you have never programmed a single line of code, you can still use panStamps with any of the available applications and then configure the boards using SWAPdmt, our Device Management Tool for SWAP networks. Lagarto is written using Python and has an open architecture. New Lagarto servers and clients can be developed using any language. Moreover, Lagarto servers can be queried using simple HTTP GET/POST commands so communicating with existing applications should not be a problem. As result, we can say that your ideas can be developed on both sides of the above diagram: the low-power wireless network and the IP side. For more details about architectures, protocols, stack, libraries and applications please visit our documentation wiki.